When Nintendo revealed a remake of Mario & Luigi: Superstar Saga a couple years back, two thoughts came to mind. The first was how excited I was to pick it up after the letdown that was Paper Jam, and the second was that Bowser’s Inside Story would totally be made next. (No offense to Partners in Time, but most fans will point to the first and third installments in this RPG series as the best titles.) So here we are with that prediction come true, and almost the entire pentalogy available on one system. Mario and Luigi’s second remade RPG romp to hit the 3DS gets plenty of points for shifting the focus to Bowser for a good part of the game, and the timed hit tussles that make up the battle system are as fun as ever. At times, it’s a weaker entry than Superstar Saga, which had the fun of fleshing out the BeanBean Kingdom and my personal favorite Bros. Attacks, yet at others it stands side by side, and even above, its predecessor. There’s lots of fun to find in the inner workings of the Koopa King, and at key moments the interplay between brothers and Bowser takes the game to new heights. A Koopa King caper featuring the Mario Bros. Things kick off with the Kingdom already in crisis due to a strange disease called the Blorbs. Those afflicted balloon up Beauregard style, and plenty of Toads are already suffering. Bowser crashes a conference on the matter, and events unfold where he ends up inhaling all in attendance due to the devious scheming of familiar foe Fawful. All of this happens fairly quickly too, with forced tutorials you may have remembered, once again trimmed down for the remake. This setup splits the game in two, which does wonders for its pacing and theming. About half the time you’ll control Mario and Luigi as they explore Bowser’s oddly structured insides, interacting with his organs to affect the big guy from within. In turn, Bowser will roam around the Mushroom Kingdom, with things he eats or encounters messing with his organs while opening new and disgusting paths for the Bros. that take their fantastic voyage further. You’ll swap back and forth, both for long and short stretches of time, to move the story along. Just when you think you could use a break from one, the other’s there to freshen things up; and even if you don’t have any reason when it comes to plot, you have the freedom to swap at positions almost any time if you so choose. The strength of this aforementioned theming and use of Fawful (and a few other, key supporting characters) are high points that help the game go toe to toe with Superstar Saga, but where it really shines is Bowser himself. This is the King at his finest with bravado and buffoonery in nearly equal measure. The majority of the game’s humor and charm comes from him, and while he loses a bit of his edge as an outright villain, it’s worth it to have him this involved with the adventure. You’ll see him talk trash to pretty much everyone he meets, punch out anyone who crosses him, demean and support his minions at the same time, and plenty more. Bowser doesn’t just spice up the story though; he adds a few new spins on the gameplay as well. In the overworld he can’t jump, for one, which can really mess with how you approach areas if you’re coming in with a Mario mentality — at least at first. Instead, he can punch big blocks and other obstructions into oblivion, burn certain obstacles to a crisp, and use his shell to scale walls. Mario and Luigi’s own exploration hasn’t changed much at all. Whenever they’re inside Bowser the camera keeps things at a 2D perspective, which helps sell the idea of their different scales during this adventure. To put a spin on their gameplay, they also get a chance to stretch those legs in three dimension. 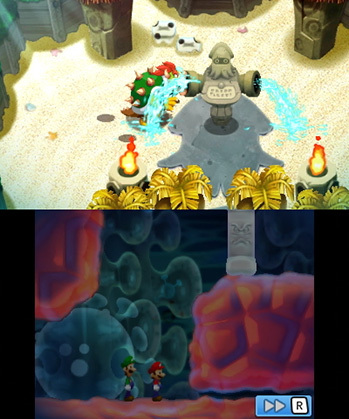 Outside of Bowser they’re able to reach areas he can’t, letting you think about the environments a little differently on a second run for buried collectibles and out of the way blocks. 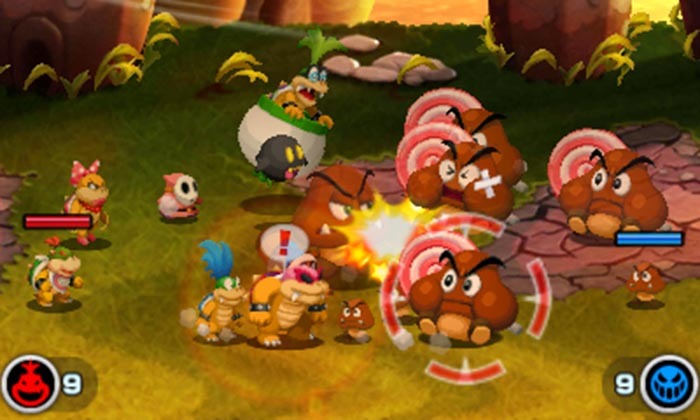 Battles are familiar and just as fun as in Superstar Saga, with Bowser controlling similarly to the series’ standard, though with his own unique takes on the system. Rather than jump over attacks, for example, he’ll be punching them out of the way or ducking into his shell. Due to acting as a single character, he’s got beefier stats, and has his own special techniques involving his minions rather than the brothers’ team-up attacks. For Bowser, these utilize touch controls, while the Bros. stick to buttons for theirs. 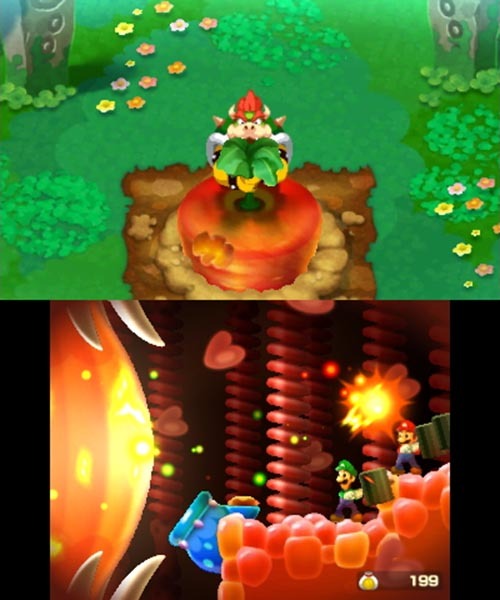 Mario and Luigi use random items rather than the skills they gain over the course of the game, losing some of the charm from their original journey, even when these items are pretty imaginative (even by this series’ standards). It’s the boss fights though, where gameplay gets really unique. 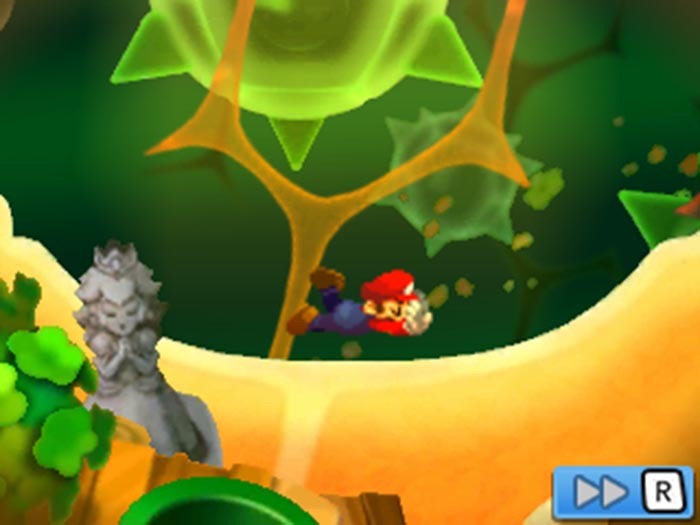 For one, certain battles involve Bowser inhaling elements of the boss so the Mario Bros. can take a whack at it from inside, making the most of the game’s setup. Speaking of which, various events and some Italian intervention cause Bowser to occasionally grow to massive sizes for an entirely different kind of fighting against similarly gigantic foes. As a gimmick and story beat they work, though I’m glad they don’t overstay the welcome due to their differences from the main battle system and reliance on touch controls. Really, the biggest strikes against the game at this point are just how “samey” it feels on 3DS at this point. After two original entries and Superstar’s remake, this is the fourth Mario & Luigi game on the system, and even with their story and theming strengths they’re starting to somewhat blend together. If not for the strong hook and Bowser’s presence, this one would run the risk of being just another entry. Nearly every criticism and quibble I had for Superstar Saga filters over to this title, such as the loss of the 2D sprites and updated music, though the changes are less jarring due to the game’s original place as a DS title. Taking one more page from its older sibling, this release has a second story starring a pint-sized bad guy. It’s no Goomba this time, but rather Bowser Jr. leading the charge to try and cure the Blorbs from behind the scenes while his dad goes off and does his own thing. The gameplay here hasn’t changed much from the last version, still featuring three different kinds of troops ramming into each other out of your direct control until you win, or until you lose, and have to reorganize your army. While Minion Quest had the slight benefit of more Fawful and the surprisingly earnest Captain Goomba, here instead we’ve got to deal with a trio of his underlings posing as door to door supplement sellers and Bowser’s bratty boy. Maybe some will enjoy his bashing of any and all guidance from other characters, but he can’t hold a candle to his papa when it comes to carrying a game. Jr.’s Journey does get points for giving the Koopalings more prominence and personality than they’ve had in the past though. Check it out for sure, but ultimately, its gameplay comes off as bland and just a vehicle for the side story. Ultimately, I walked away from my time with this remake having a new appreciation for the original. Already a game I respected and enjoyed on DS, it still never matched the GBA original for me. Now that I’ve played both of them on 3DS I can see where (just like the Mario Bros. games) the younger sibling deserves a little more respect. Both are absolutely worth playing and my personal recommendation still goes to Superstar, but the new coat of paint looks a little better on this one. 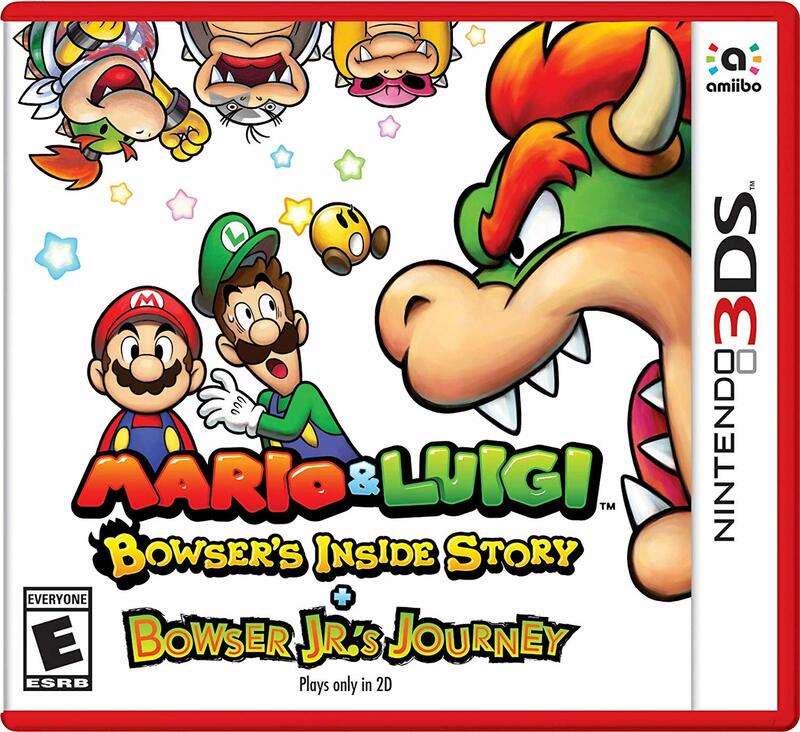 Mario & Luigi: Bowser’s Inside Story + Bowser Jr.’s Journey brings the Bros. and their number one enemy back for a fun adventure that goes micro, macro, and everywhere in between. Carried by just how enjoyable Bowser is, the strong theming that affects both story and gameplay, and the always splendid battle system; it brings an already great game back for an encore. Bowser Jr.’s Journey doesn’t have much to show and it runs the risk of feeling samey thanks to just how many other M&L games are on 3DS now, but if you only had to pick one this might just be the best.